Like “My Butterfly” before it, “My Moment Of Un-Truth” is airing out of order, as indicated by the return of Elliot’s full glam appearance and by the lack of acknowledgment of a range of different ongoing character arcs. However, at the same time, it wouldn’t be unreasonable to view the episode as simply a standalone episode in the season if we were to consider only its narratives, which mostly work as contained storylines with no large-scale reverberations. It’s plausible that Carla’s flirtations with former co-worker Ron (Nestor Carbonell, his natural eyeliner overshadowed only by Elliot) could have turned into a turning point in Turk and Carla’s relationship, but it immediately registers as her version of the “wedding jitters” trope that will follow with Turk in the following episode. The storyline gives Judy Reyes a chance to play Carla’s insecurities for a change, and the focus on her character also gives the show an opportunity to move outside of the male gaze (even if the episode ends with Turk blatantly staring at an anonymous woman’s posterior with Carla’s permission, as though she would be the only injured party, but I’ll not stress that point given how endemic it is to the show’s broader perspective). It’s also a rare story that allows J.D. to step into a supporting role, foregrounding his relationships with both Turk and Carla but not really giving him a story about himself. That burden shifts mainly to Elliot, who gets what I consider a fairly iconic story for the series even if it’s ultimately a small one. Part of this is that Alexander Thompson—one of Bill Lawrence’s Spin City alums—will recur over the course of the series, but it’s also the kind of story the show has done often. Elliot’s naiveté is exaggerated, Cox’s knowledge proves prescient, and Elliot—and thus the audience—learns a lesson about how difficult it is to treat pain patients when you know in the back of your mind that they could be drug addicts looking for a fix. 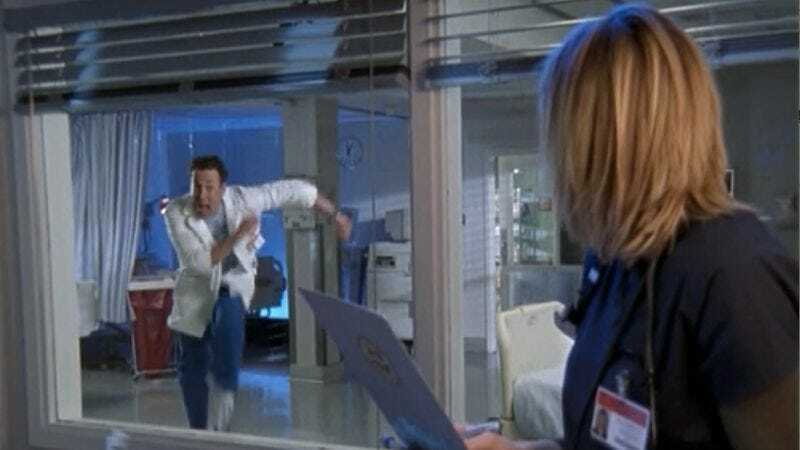 That Sam Thompson becomes a recurring presence only reaffirms the degree to which the character represents a specific phenomenon in hospitals, and it helps give what is otherwise an out-of-order and procedural storyline a sense of weight to the series’ larger narrative and broader thematic concerns. When you’re dealing with an episode that doesn’t necessarily connect to larger threads, your standalone storylines have to carry a larger burden, and “My Moment Of Un-Truth” does this with both Thompson’s first appearance and with what also feels like an iconic Janitor storyline. We only get a few scenes with the Janitor attempting to fake having a twin brother named Roscoe, and they’re always intersecting with an otherwise unrelated moment where J.D. and Turk are having a conversation tied to the episode’s A-story. Despite this, the story has a clear beginning, middle, and end, with the window escape/ambulance pratfall action sequence bookended by J.D. and Turk’s nonplussed skepticism and eventually J.D.’s good-natured attempt to humor the Janitor—it’s a light storyline, but it’s a light storyline that lands, helping the episode prove an enjoyable rewatch despite the lack of inherent weight to ongoing concerns. By comparison, “His Story II” seeks to tell a distinct standalone story that more expressly ties into ongoing storylines while having a weight of its own. Like “My Moment Of Un-Truth,” the episode builds anticipation for Turk and Carla’s wedding, shifting its focus from J.D. to Turk as the latter weighs mailing the invitations that will make their coming wedding a reality. At the same time, though, it also finally returns to Sean, whose presence in Elliot’s life has been largely taken for granted as the show shifted its attention toward Dr. Cox, and whose return at episode’s end complicates yet another moment where J.D. and Elliot fall into bed together. That latter development is a clear case of a season needing to pivot into its final episodes with an injection of capital-p “Plot.” As much as Turk and Carla’s wedding offers a clear structure around which to center the season’s final episodes, the tension there is not enough to hang a climax on. You need the guests at the wedding to have their own drama, and to tie into the season’s larger narrative, and that mostly comes with Sean’s return. It’s undeniable that the stakes are raised when J.D. and Elliot sleep together, share a parting word, and then are interrupted with Sean illogically shows up at J.D.’s apartment to whisk Elliot away. It’s a storyline that can’t help but suffer under the weight of its conclusion, although I would argue it struggles regardless. The issue is with Elliot’s motivation, which is too ephemeral when it needs to be resonant. Her conversation with her overly attractive patient with the hobbit-esque husband is too blatant in planting the seed of the “person who’s always there for you,” and the final scene is way too blatant with how Elliot repeats that mantra about Sean just after reiterating it to J.D. The show has backgrounded the love triangle too much for Sean’s absence to convince Elliot that J.D.’s proximity outweighs her feelings for Sean, and the way she quickly changes her mind portrays her as flighty in a situation that could have foregrounded her agency but instead makes it seem like she throws herself at men to serve the needs of the narrative. It’s frustrating in this episode in particular because Turk’s storyline is so much more deliberate, which makes me wish it was “His and Hers Stories” so that we could get more perspective for both Turk and Elliot in the episode. Turk’s relationship with Brian, a young concert pianist, is a fairly typical doctor/patient dynamic up until the point where he makes a mistake in surgery that cuts his career short. It’s a simple mistake that could have been far worse, but he knows how it’s not a small mistake for the kid whose hands are his future, and the episode uses it to give Donald Faison a chance to show how vulnerable Turk can be beneath the jock exterior. The show has dealt with losing patients before—and makes a joke about it as J.D. stays in clown makeup to let a patient’s family know about a mistake in surgery—but it’s not every day that you have to live with that mistake in the way Turk does, especially one that so pointedly (if conveniently) affected a young patient. It’s less a parallel to Turk not mailing the invitation as it is a more meaningful moment which puts the invitations into perspective, and it resonates as one of the series’ stronger Turk stories that remains adjacent to his relationship with Carla while primarily exploring the character as an individual. “His Story II” also brings back Bellamy Young, and crafts a C-story about Cox and Kelso fighting over her professionally. I appreciate the way the episode manages to avoid turning it into a romantic triangle, but it definitely doesn’t register as anything other than a way to kill a bit of time. In a perfect world, Scrubs would have developed an “Elliot in Clown Academy” webseries to air alongside this episode. “A little show I like to call indisputable evidence.” I’d watch Indisputable Evidence. “I think what angry disturbed clown is trying to teach us is that it’s never okay to push.” I’d also watch Angry Disturbed Clown. Next time on Scrubs: A love interest returns, and a choice is made.